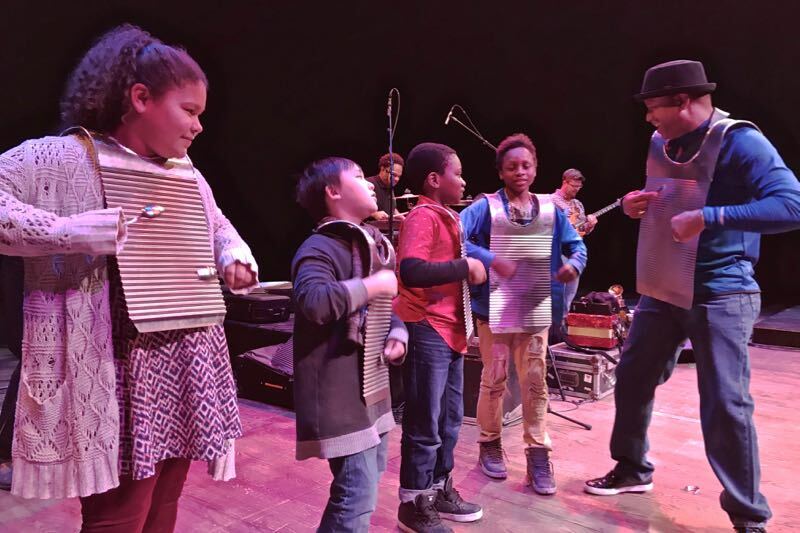 Dare County Arts Council is partnering with Dare County Schools and The Bryan Cultural Series to bring Creole for Kidz!, a music residency featuring two-time Grammy Award-winning musician Terrance Simien and the Zydeco Experience to Dare County Schools this fall. The residency is comprised of hands-on music performances at six different schools October 24-26. Created in 2000, Creole for Kidz and the History of Zydeco is a high-quality multicultural performing arts program centered on the history and evolution of the unique American roots music genre known as Zydeco. The goal of Simien’s residency is to foster a love of American roots music in the students of Dare County and to provide educational tools for them to think critically about music performance. Creole for Kidz! begins with students getting a hands-on, informative lesson about music appreciation and history, American history, social studies, and geography. The program concludes with Simien and The Zydeco Experience band delivering a fun, energetic performance. The live performance includes students singing along with the band when they perform “Gonna Take You There,” which was featured on the soundtrack of Disney’s “Princess & The Frog” movie. Exact performance dates, times and school venues will be announced soon. Mr. Simien and his band will also perform on Saturday, October 27 at The Bayou Ball sponsored by TowneBank, a benefit to support Dare County Arts Council’s programs, including Creole for Kidz and the History of Zydeco. Tickets to The Bayou Ball will be available soon. For more information about Creole for Kidz! or The Bayou Ball, please call Dare County Arts Council at 252 473 5558 or visit DareArts.org. Organizations and businesses interested in helping underwrite this residency can contact Dare County Arts Council Executive Director Chris Sawin at DareArtsInfo@gmail.com. This project is underwritten in part by The Camp-Younts Foundation.